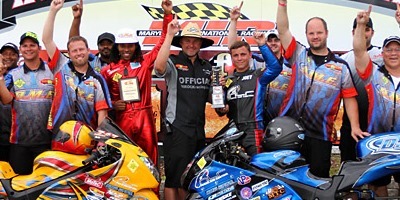 Dimey Eddinger’s DME Racing team set a new standard for itself at the most recent MIRock Superbike Series event at Maryland International Raceway on May 31-June 2, locking down both lanes in the Orient Express Pro Street final round. It was no surprise that points leader Joey Gladstone was shooting for the win at the end of the day. After qualifying #2 with a 7.12 at 209.82 mph, Gladstone raced his way past Carl “Junebug” Lucas, David Martin and Michigan superstar Bud Yoder to get there. But it was surprising even to the team that DME customer Terrence Angela, a Pro Street rookie from the tiny Dutch Antilles island of Aruba, would be Gladstone’s opponent. Angela struggled in qualifying, logging only the 12th quickest time with a 7.47 at 200. 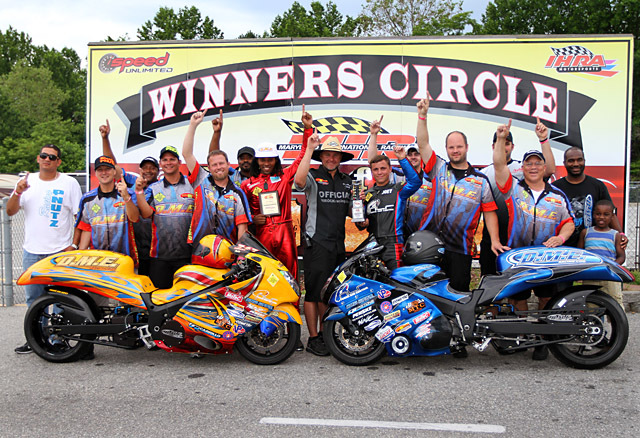 But he and his turbocharged DME Suzuki Hayabusa came alive in eliminations, taking out first-in-the-6s Ryan Schnitz in round 1, Eddinger himself (testing Jason Dunigan’s DME bike) in round 2, and #1 qualifier Rodney Williford in the semi. Gladstone had lane choice and took the tree with an .054 light. Angela started a good deal behind with a .108, but proceeded to throw down a 7.03 at 209—the rookie’s second 7.0 pass of the day. That was extremely quick, but not quick enough to make up that starting line difference as Gladstone ran 7.06 at 209.98 for the holeshot win. High-res images for editorial use are available by e-mailing timhailey@earthlink.net .